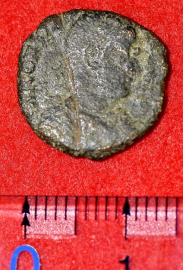 According to a number of archeologists who have analyzed the coins, this is the first time such an artifact from the Middle Ages to Early Modern period have been excavated from a historical site from the same period. The coins had Roman letters and Arabic letters respectively, as well as portraits of the emperors of the time. The study was undertaken by the Uruma BoE with government funding from the Agency for Cultural Affairs. In December, 2013, excavation and analysis began in the eastern section of “Enclosure 4,” in the area around Katsuren Castle’s walls. A total of 10 copper minted coins were found. Four of the coins were ascertained to be from the Roman Empire in the third to fourth century, and one was made by the Ottoman Empire sometime between 1669 and 1979. The five remaining coins are still being studied. The coins from the Roman Empire have a diameter of 1.6 -2 cm, and weigh from 1.5-3.6 grams. They appear to be from 337 CE to around the middle of the fourth century, and x-rays have revealed the image of the Roman Emperor Constantine I. Meanwhile, the coin from the Ottoman Empire has a diameter of 2cm, and weighs 1.2 grams. Researchers confirmed that the back of the coin showed both the word for Istanbul and the year of issue. Porcelain as well as old coins from China and Southeast Asia in the 13th -14th centuries were also found around the excavation site. The coins will be displayed at Uruma City Yonagusuku Historical Museum’s “New Discovery Exhibit” until November 25.